DON'T WANT TO HOLD A SWEATY PLASTIC BOTTLE? The HIWILL is made of premium 18/8 food grade stainless steel. This bottle keeps your drinks cold & hot for many hours! It will also never sweat no matter what the drink temperature. So it's time to say goodbye to plastic water bottles now! This new and improved double walled bottle is 30% lighter but still strong as ever! 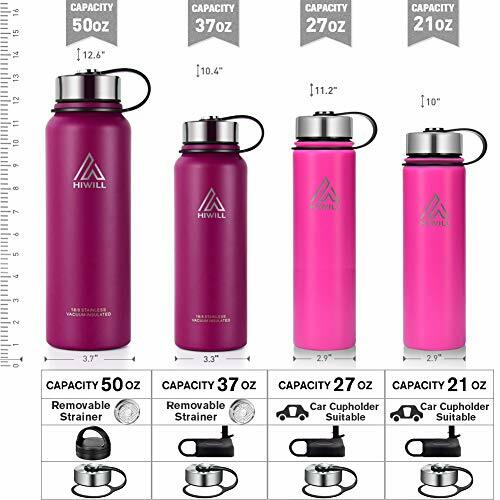 This sleek and rugged sports water bottle is made from high quality 18/8 stainless steel that will not break. It will never leave a metal taste or rust. STILL USING LOW QUALITY BOTTLES THAT SWEAT AND LEAK? LOOKING FOR A BOTTLE TO CARRY ANYWHERE? 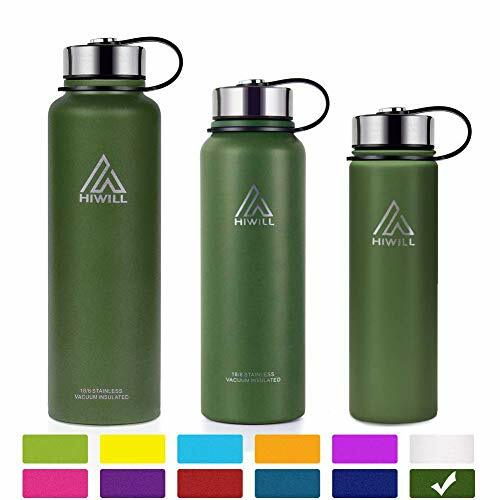 This HIWILL double wall vacuum insulated bottle will meet all your needs! Whether you fill it with boiling water or a pack of ice, the bottle will never get hot or cold to carry! You can use at the office, the gym, or even for outdoor activities such as camping and hiking! LOOKING FOR A HIGH QUALITY BOTTLE AS A GIFT? This fashion designed water bottle which has high quality is a perfectly gift for men and women, boys and girls! What are you waiting for? Click "Add to Cart" to Order the HIWILL Now! Please note that the Large HIWILL bottles(50oz & 37oz) do NOT usually fit in the standard cupholders. 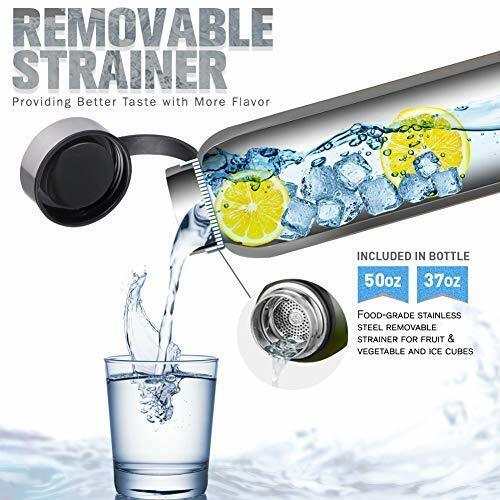 STURDY, DURABLE QUALITY: This sleek and rugged sports water bottle is made from high quality food grade 18/8 stainless steel that will not break. It will never leave a metal taste or rust. Better than using plastic or glass water bottles! Perfect for women and men, boys and girls! FUNCTIONAL DESIGN: The powder coat exterior finish is a classic. It assures that you stand out with a very durable and simple modern shape bottle. The wide-mouth opening makes this double walled vacuum insulated water bottle easier to fill up and clean. Fashion design let you carry it easily while camping, hiking, or doing any other outdoor sports. Offer colors: Black, Red, Army Green and Original Stainless Steel. LEAK PROOF LIDS: Straw Lid, Stainless Steel Lid and more options. The travel water bottle comes with leak proof caps. The HIWILL lids will prevent any accidental spills. The stainless steel repels any lingering flavors. Just put this portable sports water bottle in your gym bag or the side pouch of your backpack and you are ready to go! 100% SATISFACTION GUARANTEED: We guarantee that the high quality HIWILL bottle will surely please you! If, for any reason, you are not 100% satisfied with the HIWILL, we will issue you a full refund or an exchange! VACUUM INSULATED: Goodbye sweat! Double wall insulation makes this sports/camping water bottle sweat-free, so no coaster/cover needed! 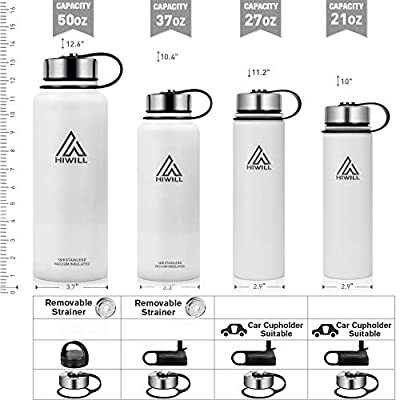 This vacuum insulated water bottle can keep your cold drink perfectly chilled up to 24 hours or your coffee, hot drink hot for up to 12 hours. It keeps the temperature inside the bottle. So you can carry the water bottle comfortably, whether it was full of boiling water or a pack of ice! Also, this will hydro guide you and keep you healthy in almost any activity!